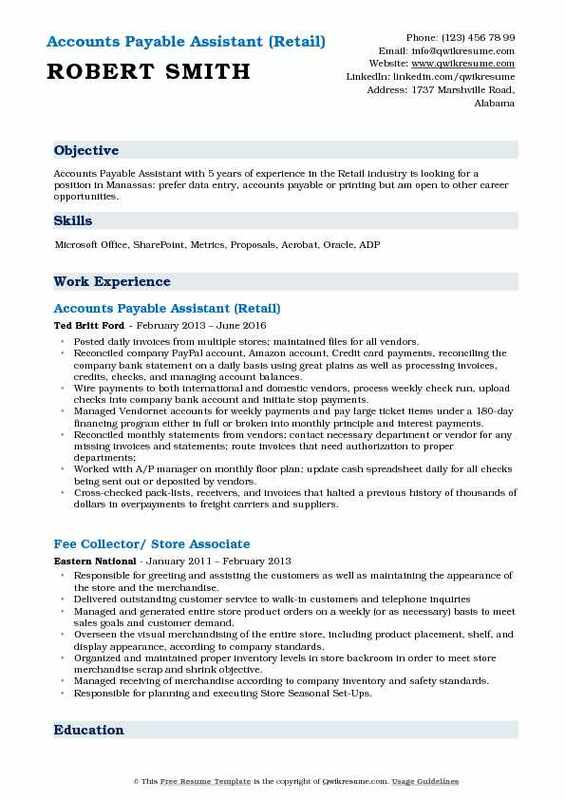 The role of an Accounts Payable Assistant is to support the accounts payable team in all aspects of accounting. 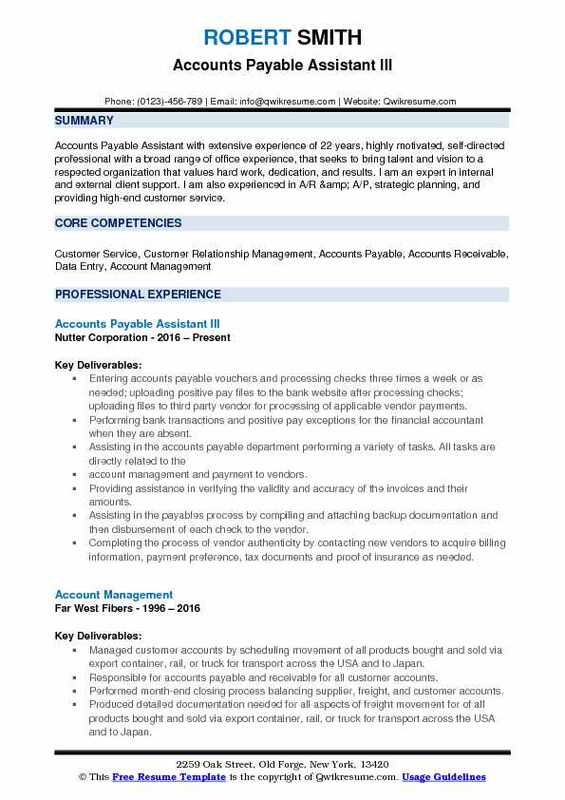 An Accounts Payable Assistant Resume highlights responsibilities like administering accounts payable invoices, entering them into the accounting software, ensuring the accuracy of the entire process and communicating with vendors. 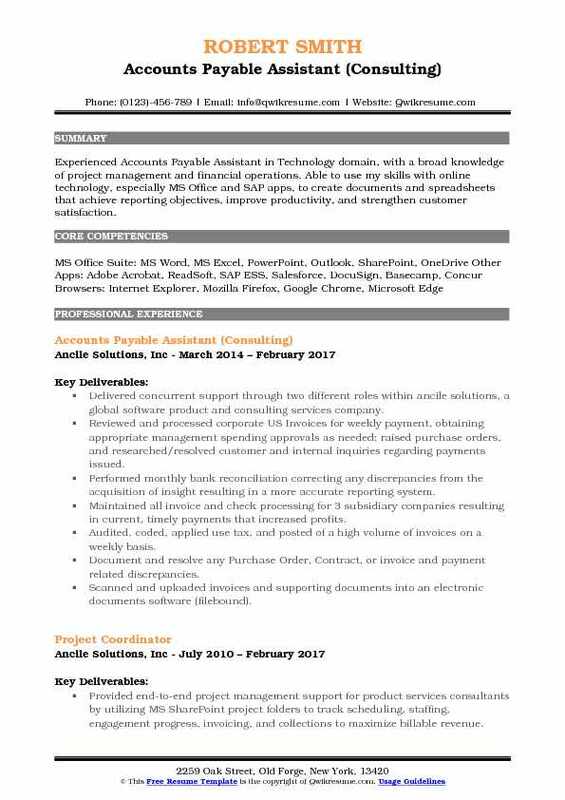 The roles and responsibility of this job description template include ensuring that the company policies and procedures are being adhered to, analyzing and doing research, resolving and providing documentation for all accounts payable inquiries by vendors and other staff. The qualification required for this position is a high school diploma or a general education degree. Associated degree in accounting or equivalent is an added advantage. The individual should possess competent computer skills, should be well organized and meticulous, have good communication skills and have a cheerful disposition with a positive approach to challenges. Summary : Experienced professional with a high degree of professionalism and strong problem resolution in all phases of the Accounting Cycle, especially in the Accounts Payable section. Daily processing of invoices, sort, coding and matching invoices. Processed an invoices volume upwards of 250 invoices per month. Performed accounts payable procedures; sorted and delivered daily mail, archived and retrieved records, performed weekly vendor and employee expense check runs. Ensured files are accurate and sent to the bank and corporate office in a timely manner. Executed direct billing duties which include generating customer invoices for direct shipments, issue debit, and credit memos, and work with the sales force to resolve payment or billing concerns. Reconciled vendor statements researching and correcting discrepancies related to pricing, quantity, and product/service specific qualities. Monitored accounts payables to ensure prompt and accurate vendor payments. Prepared accounts payable and supporting documentation for annual audits including checks, ACH, wire transfer, and credit card documents. Developed and maintained relationships with vendors providing prompt replies to relevant inquiries & concerns. Processed other expenses including utility bills, insurance bills, rental, employee reimbursements, etc. Summary : Accounts Payable Assistant with extensive experience of 22 years, highly motivated, self-directed professional with a broad range of office experience, that seeks to bring talent and vision to a respected organization that values hard work, dedication, and results. I am an expert in internal and external client support. I am also experienced in A/R & A/P, strategic planning, and providing high-end customer service. Entering accounts payable vouchers and processing checks three times a week or as needed; uploading positive pay files to the bank website after processing checks; uploading files to third party vendor for processing of applicable vendor payments. Performing bank transactions and positive pay exceptions for the financial accountant when they are absent. account management and payment to vendors. Providing assistance in verifying the validity and accuracy of the invoices and their amounts. Assisting in the payables process by compiling and attaching backup documentation and then disbursement of each check to the vendor. Completing the process of vendor authenticity by contacting new vendors to acquire billing information, payment preference, tax documents and proof of insurance as needed. Maintaining customer satisfaction at a high level by establishing excellent customer relations. 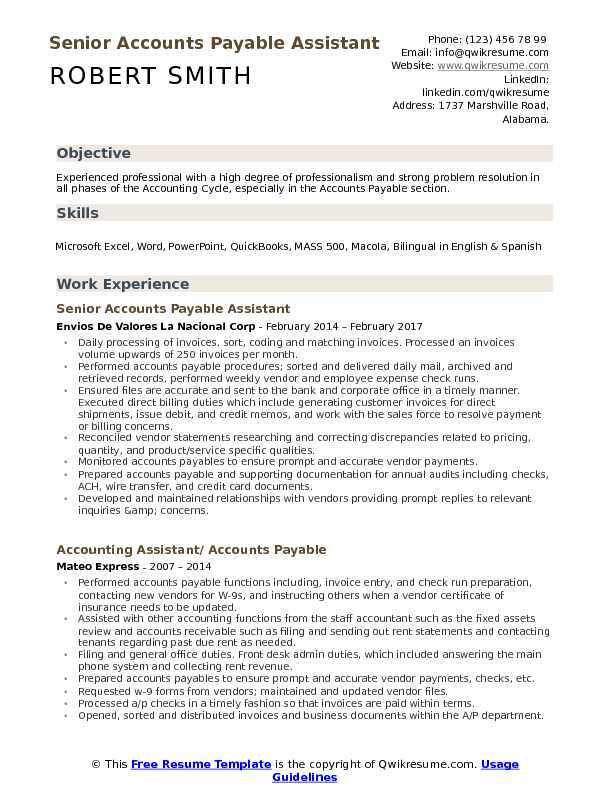 Objective : Service-oriented Accounts Payable Assistant with 4 years of experience. Areas of strength are account maintenance, customer service, A/P, developing and implementing new procedures, and ability to training and supervise other associates. Posted check requests, progressed payment, PO related invoices, and service contracted invoices into Infor/CSF software. Communicated with vendors via phone or website to request invoices via e-mail, fax or download bill from vendors website. Scanned invoices to the computer, upload each invoice to KO-fax and then attached each invoice to each payment that is pending for payment approval. Responsible for analysis, research, resolution and providing documentation for all accounts payable inquiries by the vendor and other finance staff. Managed and maintained the accounts payables help desk to ensure that all outstanding invoices are identified and paid on a timely basis. Worked with Purchase, Operation, Engineering, and Inventory department to resolve issues and obtained needed approval signatures for invoices. Procedures to ensure proper internal controls, including adherence to budget control and compliance with tax requirements. Objective : Versatile office assistant with significant experience in Accounts Payable for several mid-size to Fortune 500 companies. Always focused on accuracy and customer satisfaction, and able to quickly grasp new challenges. Managed multiple internal facilities and accounts, including Payroll and Payroll taxes. Extensive experience interacting with customers, clients, and vendors. 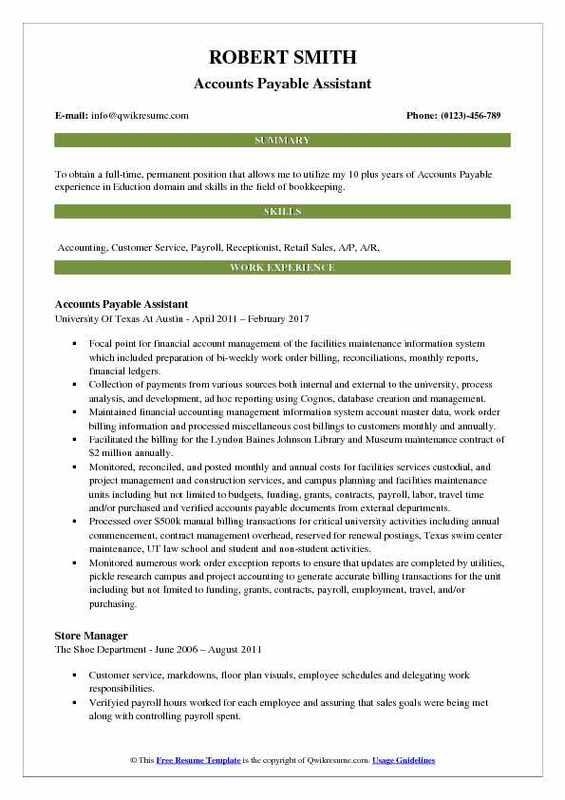 Skills : Accounts Payable, Accounts Receivable, Inventory, Payroll, Vendor Management, MS Office, Dependable, Detail Oriented, Team Player, Multi-tasking, Problem Solving, Reconciling, Self-motivated. Responsible for initiating, maintaining and monitoring subcontractor vendor accounts, i.e., contact information, applications for payment and rectifying any dispute/discrepancies. Answered vendor inquiries, performed data entry of invoices, obtained necessary approvals, processed payments, reconciled vendor weekly/monthly statements, maintained and updated vendor 1099 data for the end of year closeout. Generated reports, when needed, and performed all data entry via the sage Timberline/Timberscan accounting program. 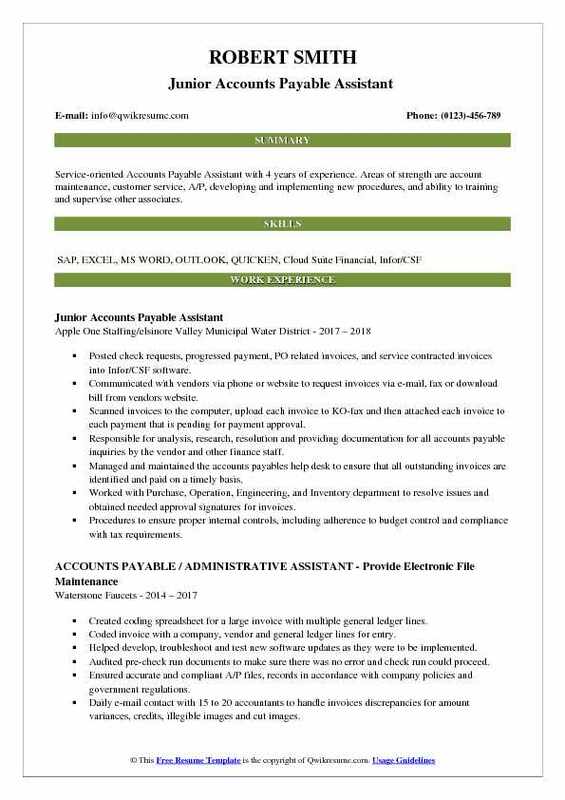 Proficient with all office equipment, including, but not limited to 10-key pad, copier/scanner, fax machine, desktop computer and multi-line phone system. Processed an average of several thousand invoices per month for a large-scale. Worked closely with accounts payable supervisor, I scanned all the backlog of invoices for the year and all of 2017. Investigated and correct outstanding invoices by reconciling vendor statement with the information in the accounts payables system. 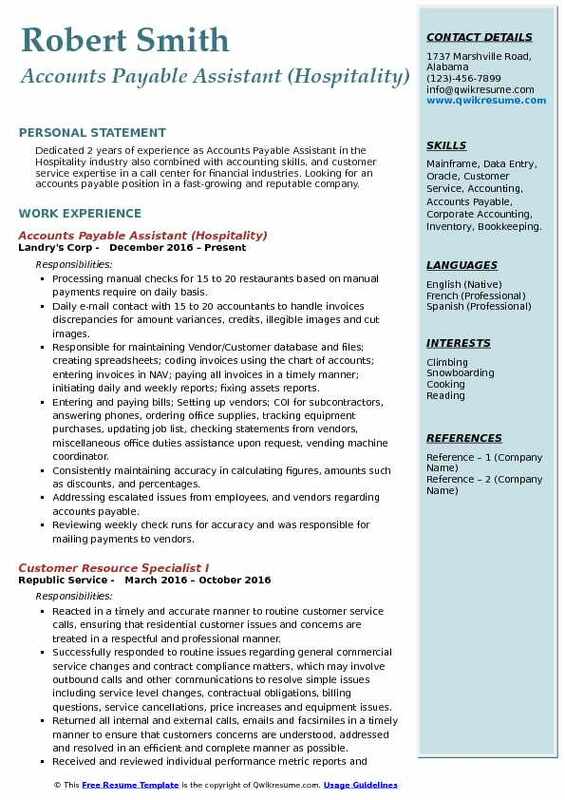 Objective : Dedicated 2 years of experience as Accounts Payable Assistant in the Hospitality industry also combined with accounting skills, and customer service expertise in a call center for financial industries. 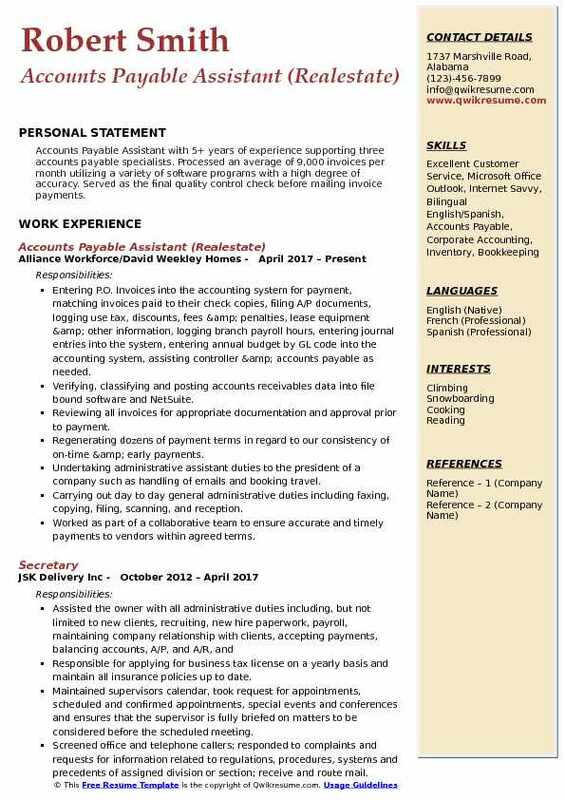 Looking for an accounts payable position in a fast-growing and reputable company. Skills : Mainframe, Data Entry, Oracle, Customer Service, Accounting, Accounts Payable, Corporate Accounting, Inventory, Bookkeeping. Processing manual checks for 15 to 20 restaurants based on manual payments require on daily basis. Daily e-mail contact with 15 to 20 accountants to handle invoices discrepancies for amount variances, credits, illegible images and cut images. Responsible for maintaining Vendor/Customer database and files; creating spreadsheets; coding invoices using the chart of accounts; entering invoices in NAV; paying all invoices in a timely manner; initiating daily and weekly reports; fixing assets reports. Entering and paying bills; Setting up vendors; COI for subcontractors, answering phones, ordering office supplies, tracking equipment purchases, updating job list, checking statements from vendors, miscellaneous office duties assistance upon request, vending machine coordinator. Consistently maintaining accuracy in calculating figures, amounts such as discounts, and percentages. Addressing escalated issues from employees, and vendors regarding accounts payable. Reviewing weekly check runs for accuracy and was responsible for mailing payments to vendors. 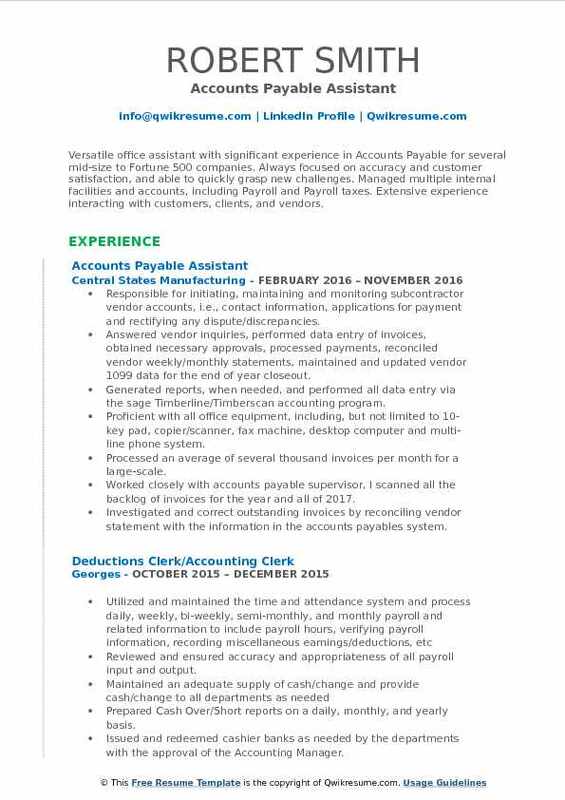 Objective : Accounts Payable Assistant with 5 years of experience in the Retail industry is looking for a position in Manassas: prefer data entry, accounts payable or printing but am open to other career opportunities. Posted daily invoices from multiple stores; maintained files for all vendors. Reconciled company PayPal account, Amazon account, Credit card payments, reconciling the company bank statement on a daily basis using great plains as well as processing invoices, credits, checks, and managing account balances. Wire payments to both international and domestic vendors, process weekly check run, upload checks into company bank account and initiate stop payments. Managed Vendornet accounts for weekly payments and pay large ticket items under a 180-day financing program either in full or broken into monthly principle and interest payments. Worked with A/P manager on monthly floor plan; update cash spreadsheet daily for all checks being sent out or deposited by vendors. Cross-checked pack-lists, receivers, and invoices that halted a previous history of thousands of dollars in overpayments to freight carriers and suppliers. 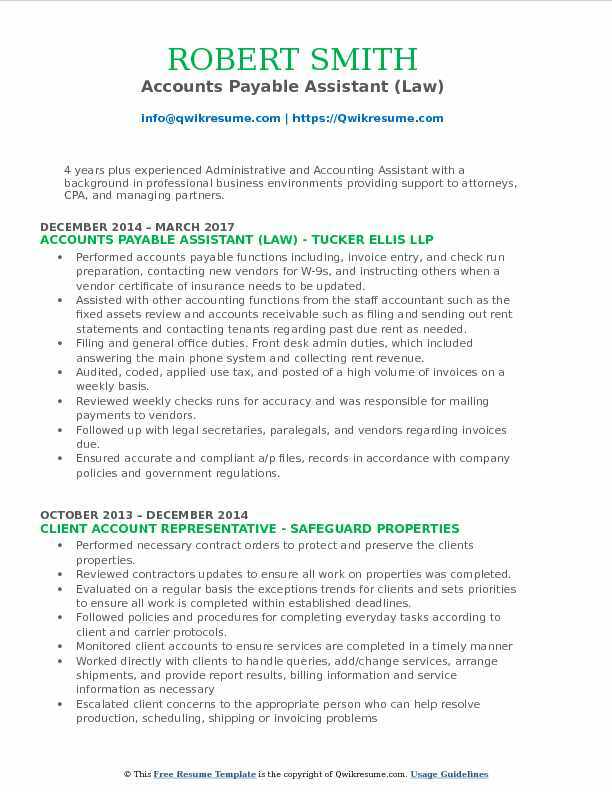 Objective : 4 years plus experienced Administrative and Accounting Assistant with a background in professional business environments providing support to attorneys, CPA, and managing partners. Performed accounts payable functions including, invoice entry, and check run preparation, contacting new vendors for W-9s, and instructing others when a vendor certificate of insurance needs to be updated. Assisted with other accounting functions from the staff accountant such as the fixed assets review and accounts receivable such as filing and sending out rent statements and contacting tenants regarding past due rent as needed. Filing and general office duties. Front desk admin duties, which included answering the main phone system and collecting rent revenue. Audited, coded, applied use tax, and posted of a high volume of invoices on a weekly basis. Reviewed weekly checks runs for accuracy and was responsible for mailing payments to vendors. Followed up with legal secretaries, paralegals, and vendors regarding invoices due. Ensured accurate and compliant a/p files, records in accordance with company policies and government regulations. Handled the processing, distribution, accuracy verification, and reconciling invoices. Summary : Experienced Accounts Payable Assistant in Technology domain, with a broad knowledge of project management and financial operations. Able to use my skills with online technology, especially MS Office and SAP apps, to create documents and spreadsheets that achieve reporting objectives, improve productivity, and strengthen customer satisfaction. Delivered concurrent support through two different roles within ancile solutions, a global software product and consulting services company. Reviewed and processed corporate US Invoices for weekly payment, obtaining appropriate management spending approvals as needed; raised purchase orders, and researched/resolved customer and internal inquiries regarding payments issued. Performed monthly bank reconciliation correcting any discrepancies from the acquisition of insight resulting in a more accurate reporting system. Maintained all invoice and check processing for 3 subsidiary companies resulting in current, timely payments that increased profits. Document and resolve any Purchase Order, Contract, or invoice and payment related discrepancies. Scanned and uploaded invoices and supporting documents into an electronic documents software (filebound). 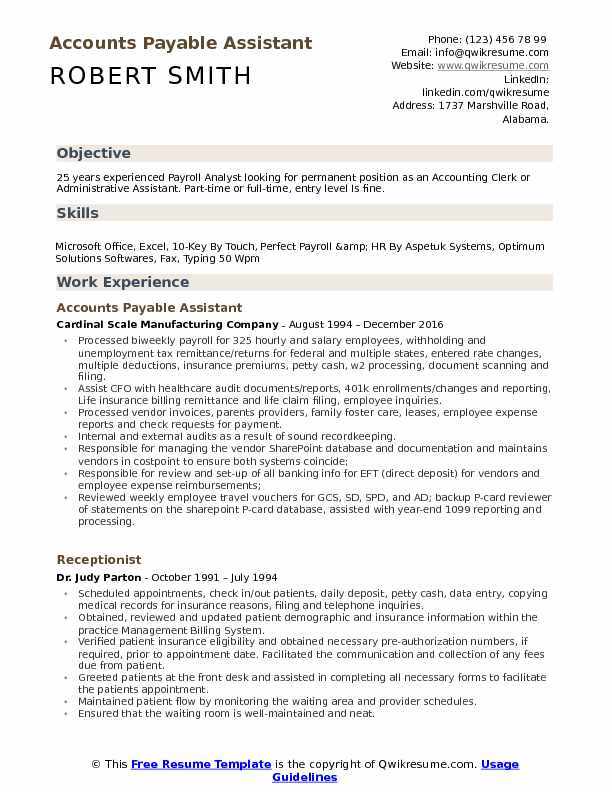 Headline : Accounts Payable Assistant with 5+ years of experience supporting three accounts payable specialists. Processed an average of 9,000 invoices per month utilizing a variety of software programs with a high degree of accuracy. Served as the final quality control check before mailing invoice payments. Entering P.O. Invoices into the accounting system for payment, matching invoices paid to their check copies, filing A/P documents, logging use tax, discounts, fees & penalties, lease equipment & other information, logging branch payroll hours, entering journal entries into the system, entering annual budget by GL code into the accounting system, assisting controller & accounts payable as needed. Verifying, classifying and posting accounts receivables data into file bound software and NetSuite. Reviewing all invoices for appropriate documentation and approval prior to payment. Regenerating dozens of payment terms in regard to our consistency of on-time & early payments. Undertaking administrative assistant duties to the president of a company such as handling of emails and booking travel. Carrying out day to day general administrative duties including faxing, copying, filing, scanning, and reception. Worked as part of a collaborative team to ensure accurate and timely payments to vendors within agreed terms. 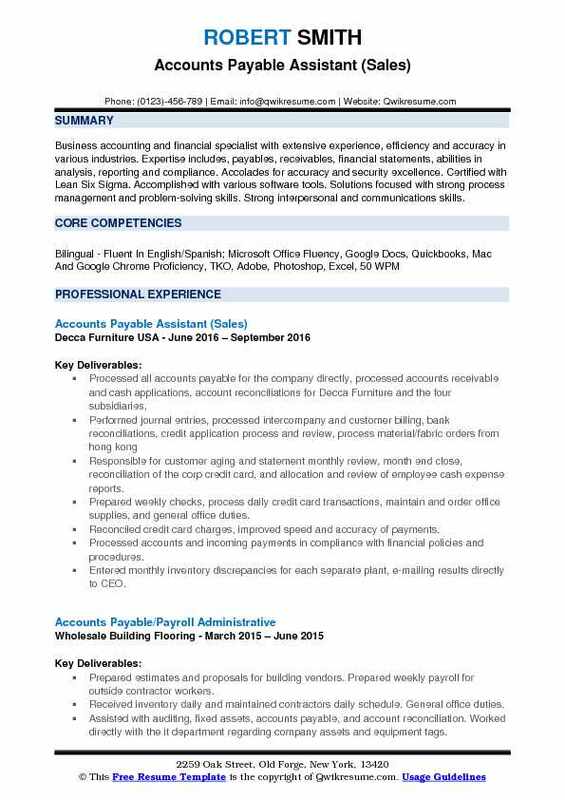 Objective : Junior level Accounts Payable Assistant with essential support as well as office, computer, and organizational competence. Reconciled, processed work by verifying entries and comparing system reports to balances charges, expenses to accounts and cost centers by analyzing invoice/expense reports; recording entries. Resolved purchase order, contract, invoice or payment discrepancies and documentation, insured credit is received for outstanding memos; issuing stop payment or purchase order amendments. Computed and prepared manufacturing overheads, direct material cost, direct labor cost, and simplify it from Oracle to excel. Worked with warehouse, vendors, and buyers to resolve order discrepancies. Processed check requests and reimbursements ensuring all appropriate approvals have been received. Verified that transactions comply with financial policies and procedures. Monthly close responsibilities, including journal entries, accruals, and account reconciliations. Summary : 25 years experienced Payroll Analyst looking for permanent position as an Accounting Clerk or Administrative Assistant. Part-time or full-time, entry level Is fine. Processed biweekly payroll for 325 hourly and salary employees, withholding and unemployment tax remittance/returns for federal and multiple states, entered rate changes, multiple deductions, insurance premiums, petty cash, w2 processing, document scanning and filing. Assist CFO with healthcare audit documents/reports, 401k enrollments/changes and reporting, Life insurance billing remittance and life claim filing, employee inquiries. Processed vendor invoices, parents providers, family foster care, leases, employee expense reports and check requests for payment. Internal and external audits as a result of sound recordkeeping. Reviewed weekly employee travel vouchers for GCS, SD, SPD, and AD; backup P-card reviewer of statements on the sharepoint P-card database, assisted with year-end 1099 reporting and processing. Headline : Business accounting and financial specialist with extensive experience, efficiency and accuracy in various industries. Expertise includes, payables, receivables, financial statements, abilities in analysis, reporting and compliance. Accolades for accuracy and security excellence. Certified with Lean Six Sigma. Accomplished with various software tools. Solutions focused with strong process management and problem-solving skills. Strong interpersonal and communications skills. Responsible for customer aging and statement monthly review, month end close, reconciliation of the corp credit card, and allocation and review of employee cash expense reports. Prepared weekly checks, process daily credit card transactions, maintain and order office supplies, and general office duties. Reconciled credit card charges, improved speed and accuracy of payments. Processed accounts and incoming payments in compliance with financial policies and procedures. Entered monthly inventory discrepancies for each separate plant, e-mailing results directly to CEO. 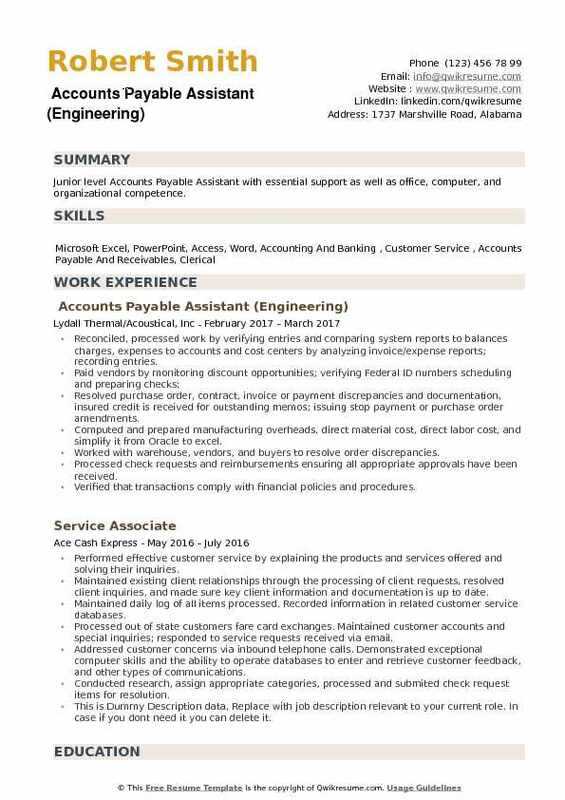 Summary : To obtain a full-time, permanent position that allows me to utilize my 10 plus years of Accounts Payable experience in Eduction domain and skills in the field of bookkeeping. Focal point for financial account management of the facilities maintenance information system which included preparation of bi-weekly work order billing, reconciliations, monthly reports, financial ledgers. Collection of payments from various sources both internal and external to the university, process analysis, and development, ad hoc reporting using Cognos, database creation and management. Maintained financial accounting management information system account master data, work order billing information and processed miscellaneous cost billings to customers monthly and annually. Facilitated the billing for the Lyndon Baines Johnson Library and Museum maintenance contract of $2 million annually. Monitored, reconciled, and posted monthly and annual costs for facilities services custodial, and project management and construction services, and campus planning and facilities maintenance units including but not limited to budgets, funding, grants, contracts, payroll, labor, travel time and/or purchased and verified accounts payable documents from external departments. Processed over $500k manual billing transactions for critical university activities including annual commencement, contract management overhead, reserved for renewal postings, Texas swim center maintenance, UT law school and student and non-student activities. Monitored numerous work order exception reports to ensure that updates are completed by utilities, pickle research campus and project accounting to generate accurate billing transactions for the unit including but not limited to funding, grants, contracts, payroll, employment, travel, and/or purchasing.